1. Chanting in Buddhism can be classified into two main types according to tradition: i.e., Theravada and Mahayana. 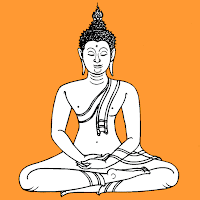 Theravada uses Pālī as the principal language, but Mahayana uses Sanskrit translated into the native language of each country. 2. The chanting of the Thai Theravada sect is further divided into two styles. In one the chanting uses the original Pālī, in the other a Thai translation. Those who chant for the purposes of "d" and "e" above may like to use the translation, comprising Dhamma discussion from the Buddha, verse from senior monks and verses from senior nuns. 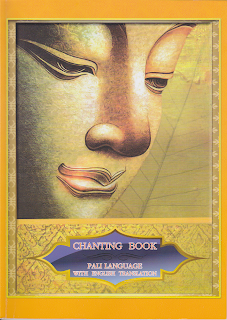 The present book contains some changes to these passages for clearer understanding and for easier chanting in English. The translations here are derived from other sources (see 3 below). Chanting in the original Pālī follows the old custom for the most part. Consequently, the kind of result a person achieves in his or her mind depends on the effort. If one pays enough attention while chanting, one will get a good result. Otherwise little benefit will be gained. Each individual has a specific purpose for chanting according to their beliefs and understanding. Some may chant to transform their minds from wicked thought to pious ones. Others may chant to their attitudes so that blessings can come into their lives. So why is chanting important for Buddhism? Chanting is important for a variety of reasons. In the first place, it is a way in which the teachings of the Buddha are brought to mind. The chants represent a significant number of Buddhist texts that can teach as well as inspire. Chanting reinforces our commitment to the Buddhist way of life by redirecting our sense of purpose at the beginning ad end of the day. 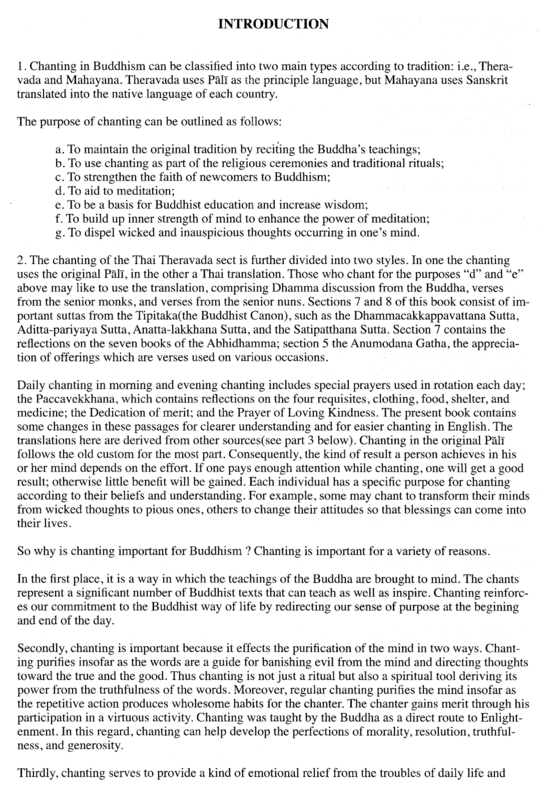 Secondly, chanting is important because it effects the purification of the mind in two ways. Chanting purifies insofar as the words are a guide for banishing evil from the mind and directing thoughts toward the true and the good. Thus chanting is not just a ritual but also a spiritual tool deriving its power from the truthfulness of the words. Moreover, regular chanting purifies the mind insofar as the repetitive action produces wholesome habits for the chanter. The chanter gains merit through his participation in a virtuous activity. Chanting was taught by the Buddha as a direct route to Enlightenment. In this regard, chanting can help develop the perfections of morality, resolution, truthfulness and generosity. Thirdly, chanting serves to provide a kind of emotional relief from the troubles of daily life and contemporary society. In the way in which it can calm and focus the mind it is somewhat akin to the more powerful sitting meditation. Furthermore, group chanting not only provides emotional relief but also a sense of belonging and common purpose as the chanters together engage in the purification of their minds together. Fourthly, chanting is important because it is a way of paying respect to the Triple Gem: The Buddha, The Dhamma and The Sangha -- The Enlightened One, The Path to Enlightenment and The Community of Monks. For instance, it is out of respect and humility that we fold our hands and bow three times: first to the image of the Buddha, then to the Dhamma and finally to the Sangha. In another respect chanting is now something that is intrinsic to every ritual or ceremony performed by Theravada monks on auspicious or inauspicious occasions. Above and beyond the aims of the aims of the Buddha Dhamma. Nowadays it is very popular to chant. 3. The first part of this Pālī-English chanting book is a collection of various passages written by different scholars specializing in Pālī for the use of the Theravada sect. These passages are not the Buddha's own words. The sources of the passages are as shown in Appendix 1: Reference Books section. 4. The original reason for producing this English-Pali chanting book was the need of the Thai missionary monks abroad, especially in the U.S.A., to fulfil their duties regarding the propagation of the Theravada Buddhist teaching. As a priority apart from meditating, they are required to be able to communicate in English with members of the non-Thai community. Initially, only Thai translations of the Pālī were used. They produced these texts from the old books and altered them to suit the needs of each temple. However, not all temples used translations, even those into Thai. Besides, contents and styles varied from temple to temple as each sought to develop the chants in the best possible fashion. Section 1 begins with morning chants comprised of passages revering the Buddha, the Dhamma, and the Sangha. It is followed by passages for reflection at the moment of using the four requisites, for the dedication and transferring of merit, and for sharing loving kindness. Altogether ten passages suitable for the morning period are included. Section 2 contains evening chants, fifteen passages in all. More time is available in the evening because all the daily business is finished and the chanting period can be extended. Thus a variety of passages to be chanted can be selected, including the discourse on the benefits of loving kindness and verses on sharing blessings. If time is limited, different passages can be chosen each day. It is not necessary to do all the chanting in one evening. Section 3 contains special chants used as tools for meditation to help to understand the purpose of meditation practice and to gain confidence to continue with it. The chants originally came from the Wat Suan Mokkha Phalaram, the forest temple in Surat Thani in southern Thailand founded by Bhikku Buddhasdāsa. Section 4 contains how to practice meditation for beginners. Parts of the original text have been omitted, changed or corrected. Omitted parts refer to sections that do not exist or exist but are labelled differently. Changed text is for clarity. Corrected text is favoring grammar, spelling or modern style. As there are errors in this text it should not be disregarded! The content is extremely important and practical. We will work to make the English of this text correct and simple to understand. The Pālī has been well preserved and is correct. Thank you for your comment. Please allow us to respond. 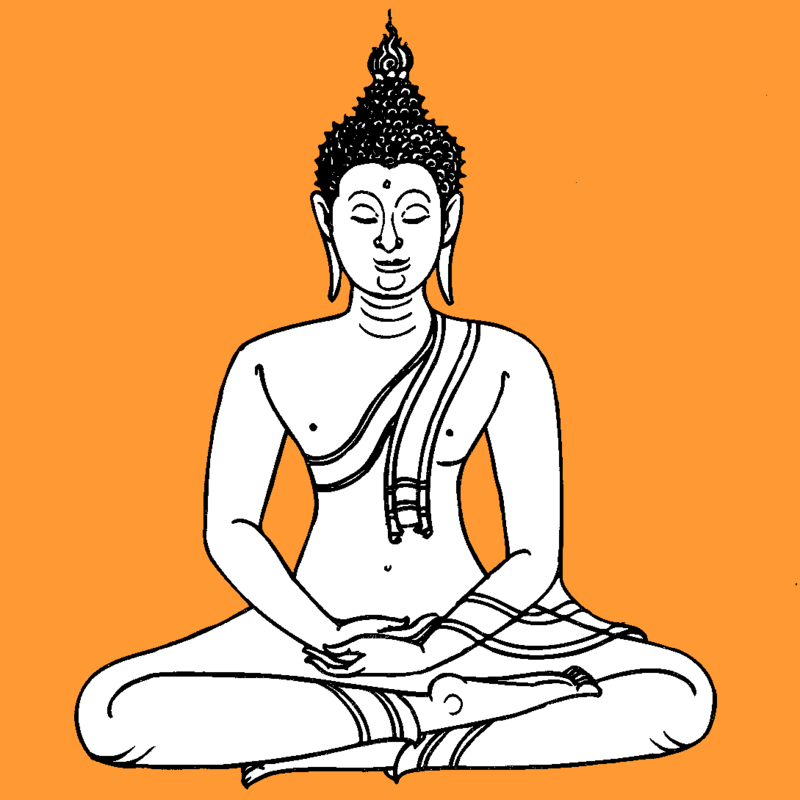 This blog is dedicated to the those who take refuge in the Buddha, Dhamma and Sangha. It is dedicated to those who have supported and continue to support Wat Pasantidhamma. It is also dedicated to our teacher Ajan Udom. Finally it is dedicated to all those who wish to end suffering. This blog is about the Chanting Book for English practitioners of the Theravada Forest tradition that can be found at Wat Pasantidhamma. This book was generously produced and given to those who want it. It is a simple guide in practice. The chants are in Pali and translated into English. This chanting is meant to awaken those into the practice of meditation. This book will be reproduced fully here and made available to anyone who is interested. We will also provide digital recordings of the chants and video as time progresses. Ajan Udom has given his permission this project. Gratefully we undertake this project with joy! Currently the Chanting Book that is available from the Temple is now available here as a PDF! The pages from an original copy have been scanned to xcf converted from XCF (Gimp) to PNG. After this LibreOffice Draw was used to put the PDF together. There is a Color Cover and a Grayscale Cover. The contents are black and white. This will all a reader to use Kindle, Nook, Kobo or another eReader, tablet or a laptop to read the text. At a later point once the the book has been transcribed into text it will be put into Mobi, eBook and other possible formats in addition to the HTML here. The text will be easier to read on various devices. This Post Has Become a Page: E-Books Please look here for the latest information.